Poor balance can lead to painful and embarrassing falls. If you would fail a sobriety test without a drop of alcohol in your system, you may need to improve your balance. While this example may seem extreme, problems with balance -- even more minor ones -- can threaten your safety. It's easy to blame clumsiness as being part of your nature and accept it as such. There are exercises you can do, however, to improve balance so you can don your high-heels and stay steady on your feet. Stand up and keep your feet shoulder-width apart. Start with your feet flat on the floor and your hands on your hip. Bend your right knee backward so all your weight is on your left leg. Tighten your abdominals and avoid swaying to keep this position for 30 seconds. Increase the difficulty by standing on a pillow. Make a straight 15-foot line on the floor with duct tape. Place your hands on your hips and walk heel-to-toe across the line. As you become more comfortable with walking a straight line, try walking heel-to-toe while wearing sunglasses to create a visual disturbance. The American Council on Exercise also recommends turning your head side-to-side while walking the straight line. Strengthen your lower body and core muscles. Weak muscles do not provide a sturdy base for balance and can increase your risk for a muscoskeletal injury. Squats, lunges and calf raises can be performed with or without dumbbells or a barbell and they strengthen your legs and glutes. Abdominal crunches and back extensions strengthen your core muscles. Lose weight if you're overweight. Excess weight can shift your center of gravity, so discuss a weight loss program with your doctor. Creating a calorie deficit based on your basal metabolic rate is the best way to lose pounds. There are 3,500 calories in 1 pound of fat, so you must create a deficit of 500 to 1,000 calories each week with diet and exercise to lose 1 to 2 pounds per week. Balance train three days per week for 15 minutes each time. 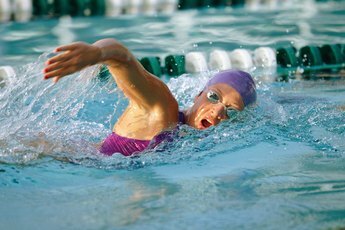 Aim for a minimum 150 minutes of physical activity per week and strength train every other day to allow muscles to recover. While barefoot, stand with your toes spread and balance on the ball of your foot. This increases the size of your base. If you have difficulties keeping your hands on your hips, try lifting your arms out to your sides so they're straight with your shoulders like walking on a tightrope. Purchase interactive video games. Popular game systems have interactive programs for fitness, which include balance exercises. There are also game activities that incorporate balance, such as soccer, tennis and dance. Enroll in a beginners yoga class. Yoga focuses on improving balance and stress reduction. Poor balance can indicate an underlying medical condition, such as an infection of the inner ear, migraines, or even a brain injury. If balance interferes with your everyday tasks, seek medical attention. Performing exercises incorrectly increases your risk of injury. Always consult with a doctor or licensed fitness trainer to monitor your fitness techniques until you're comfortable performing the exercises alone. 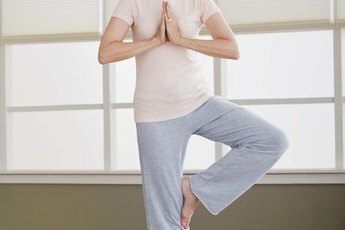 Gradually increase the difficulty of balance exercises to decrease your risk of falling. Use a wall to catch yourself if you start to fall.